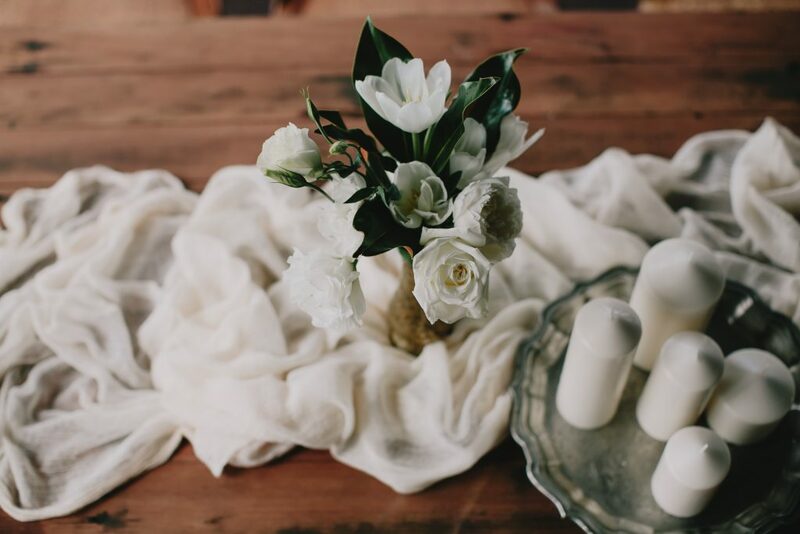 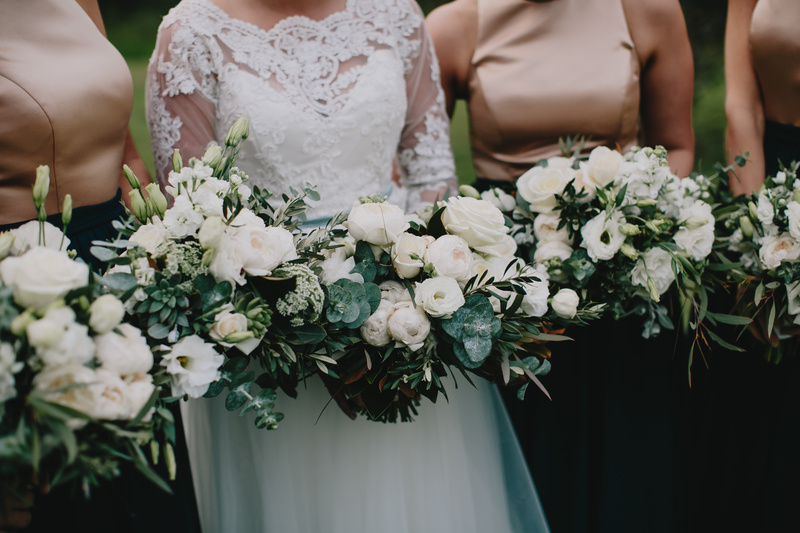 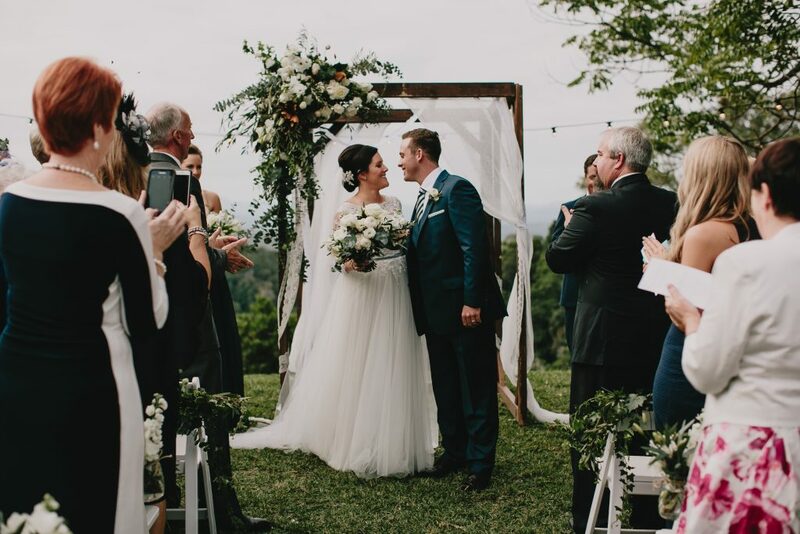 White on white wedding blooms partnered beautifully with textural greenery and touches of eclectic styling pieces and organic decor and collaborated perfectly to create Brooke and Callum’s sophisticated rustic wedding style. We adored creating the beautiful bouquets, featuring some of our much loved Autumn blooms. 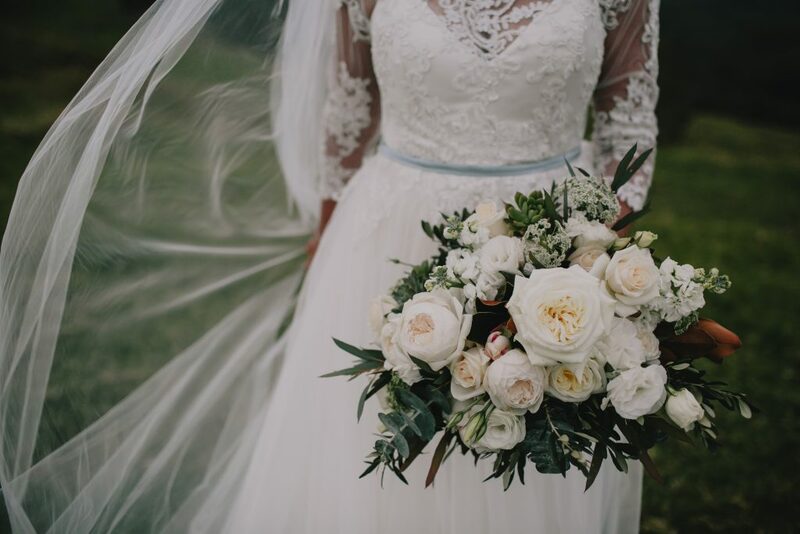 Included in the delicious line up were dahlias, David Austin roses, stock, double tulips, hyacinth, freesias and fabulous textural foliage and greenery varieties. 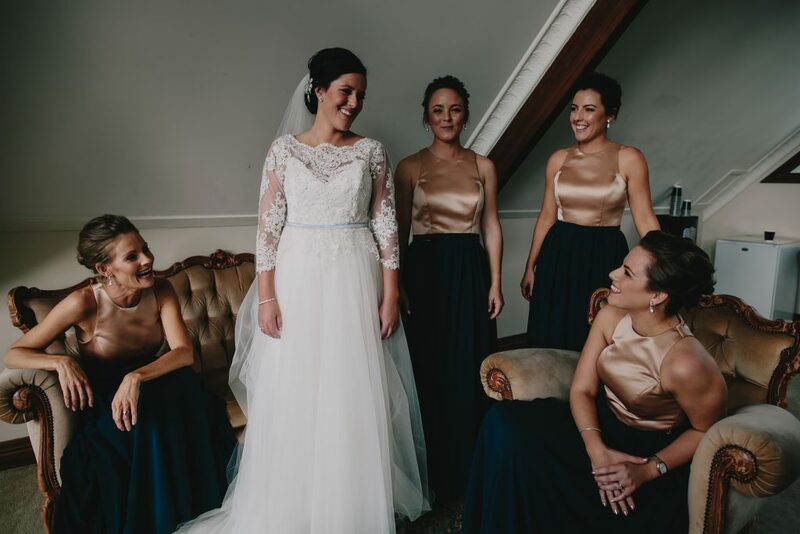 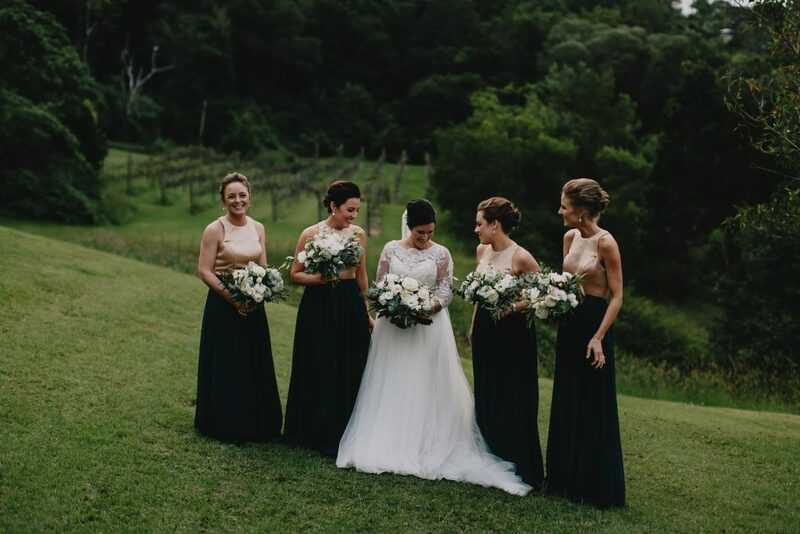 The hand- held unstructured gathered posies were perfect accessories to the glamorous bridesmaids dresses and Brooke’s stunning full length lace gown. 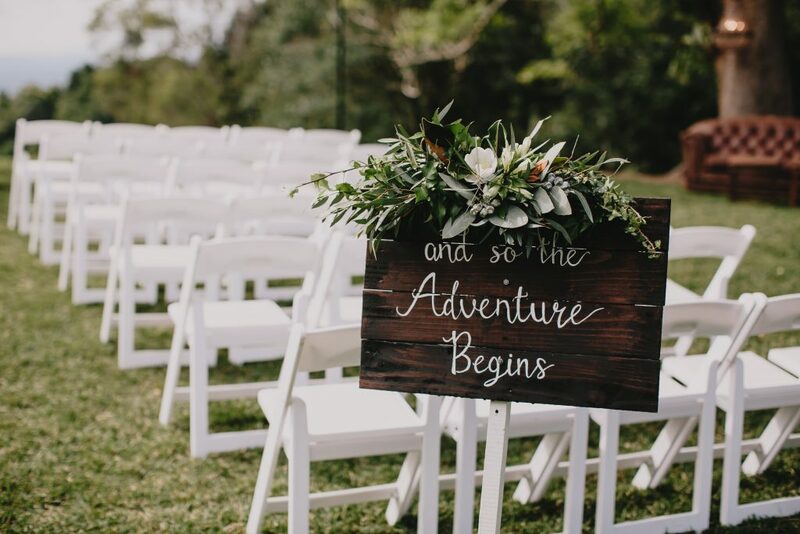 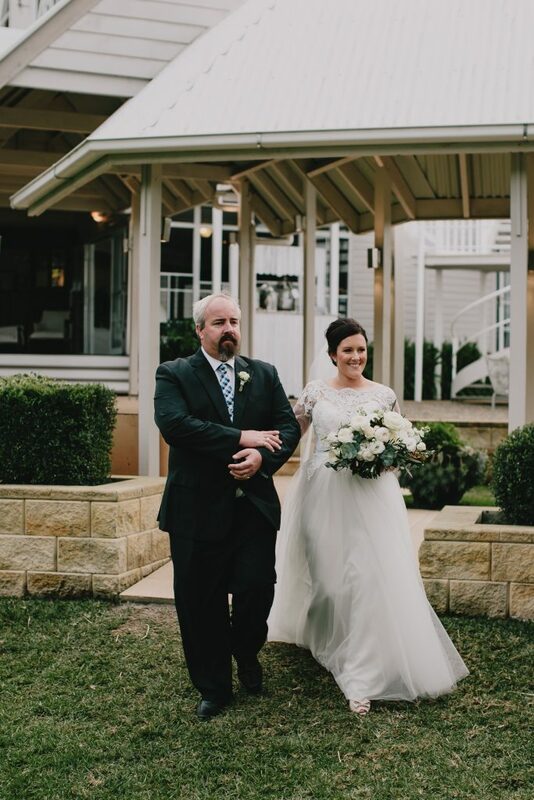 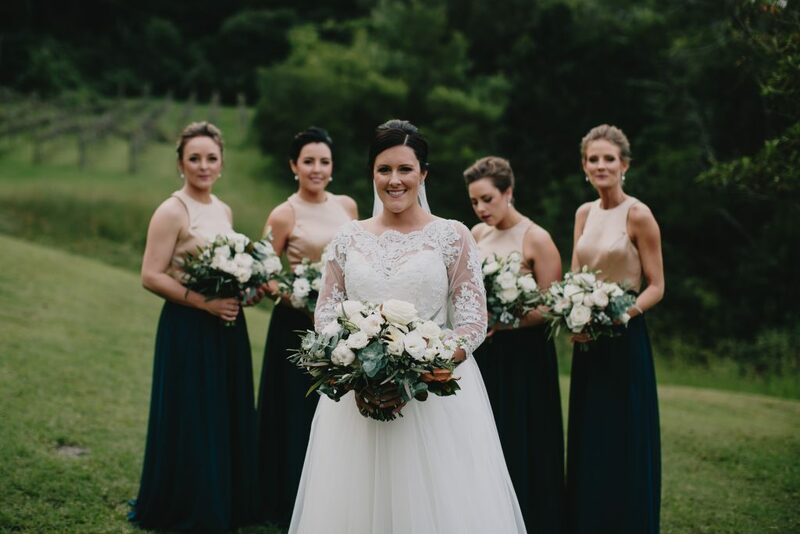 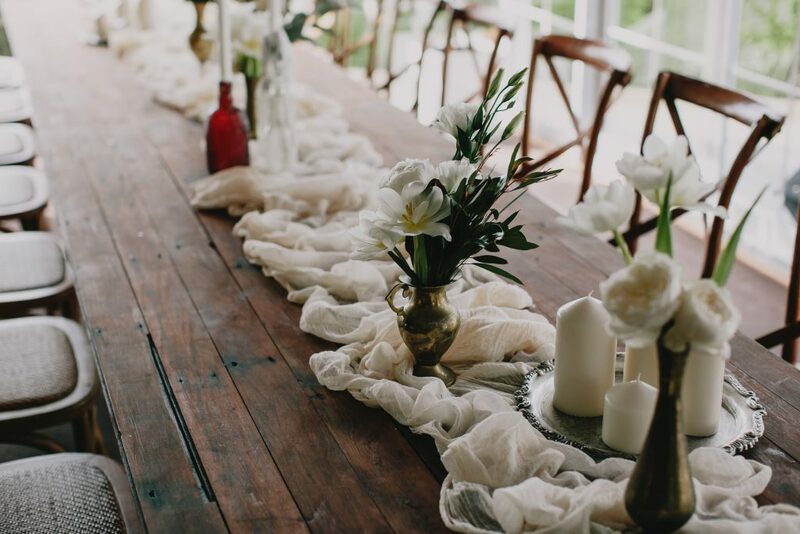 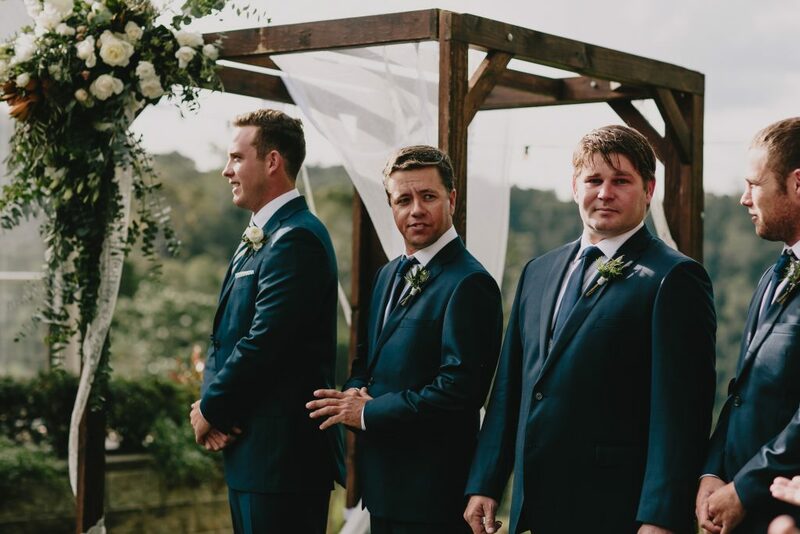 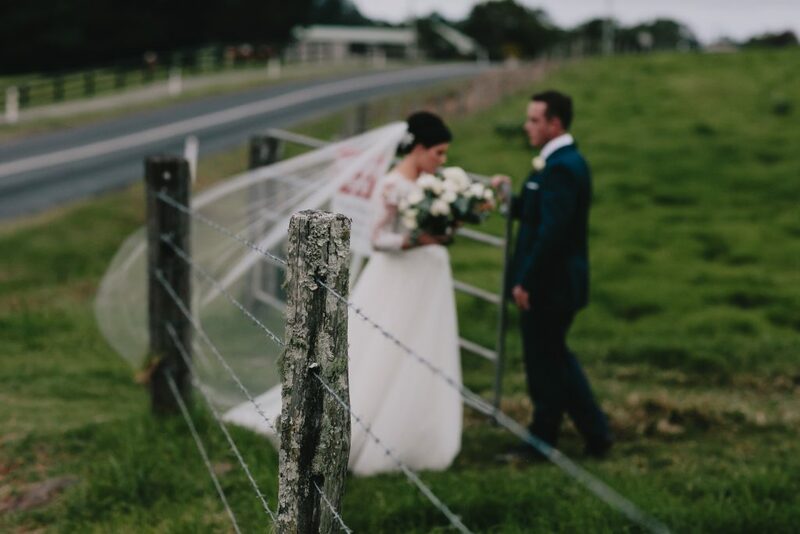 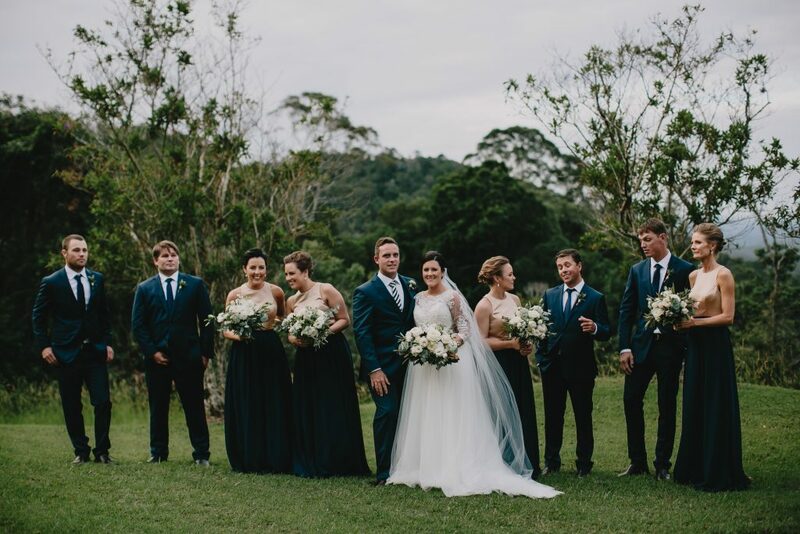 May is such a stunning time to say ‘I Do’ here in the Hinterland and how gorgeous was the outdoor ceremony style. 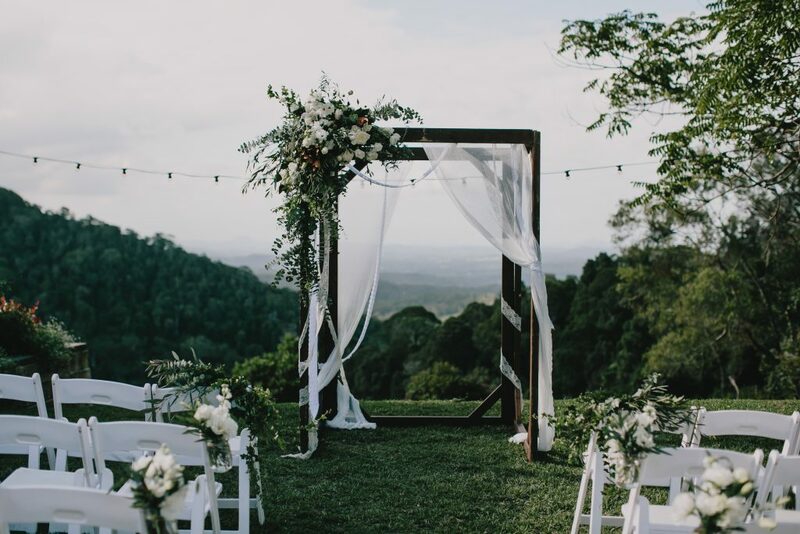 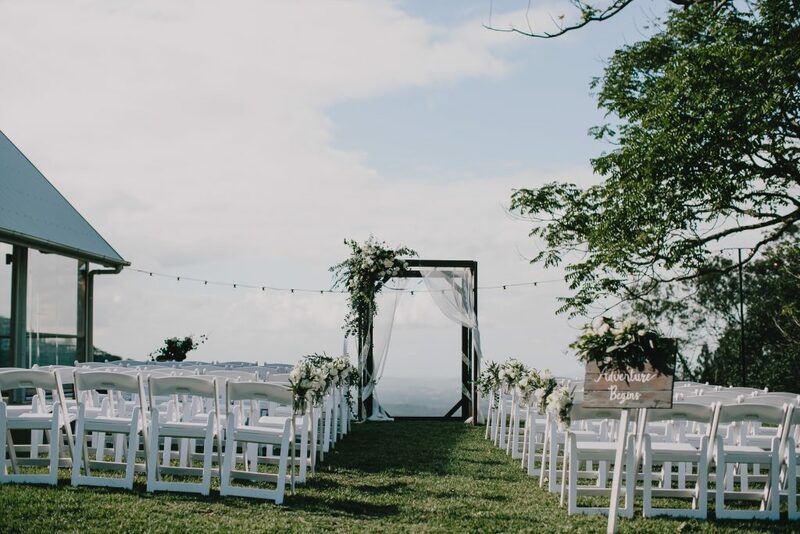 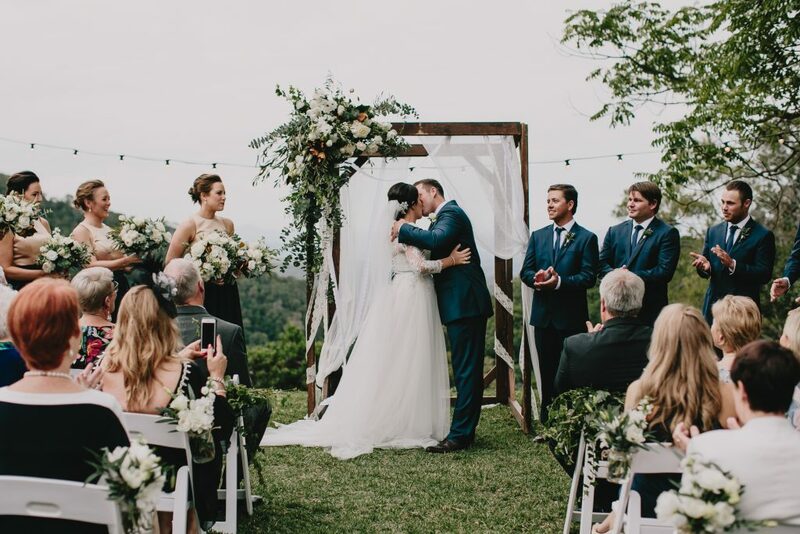 The gorgeous timber canopy was adorned with a feature floral, free flowing and whimsical, with elegant white blooms adding that further sophistication. 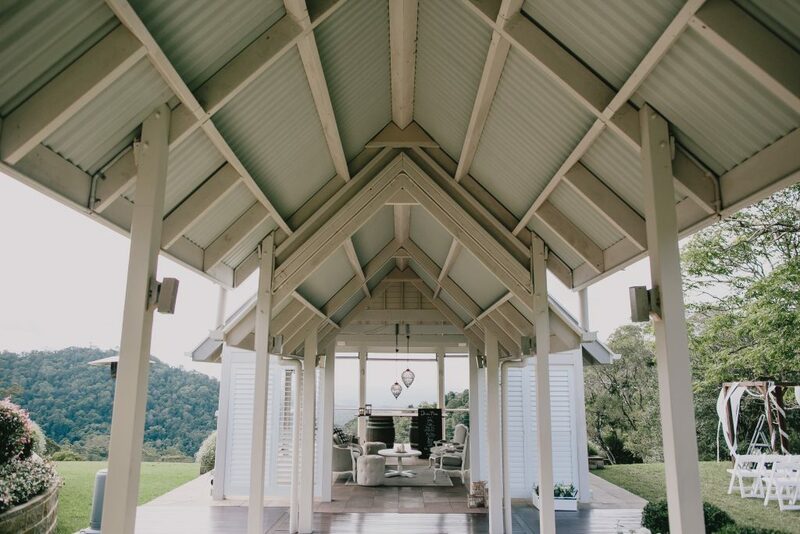 All the pretty styling details were on show, with entrance signs, chill out zones and that gorgeous pavilion featuring a divine lounging zone. 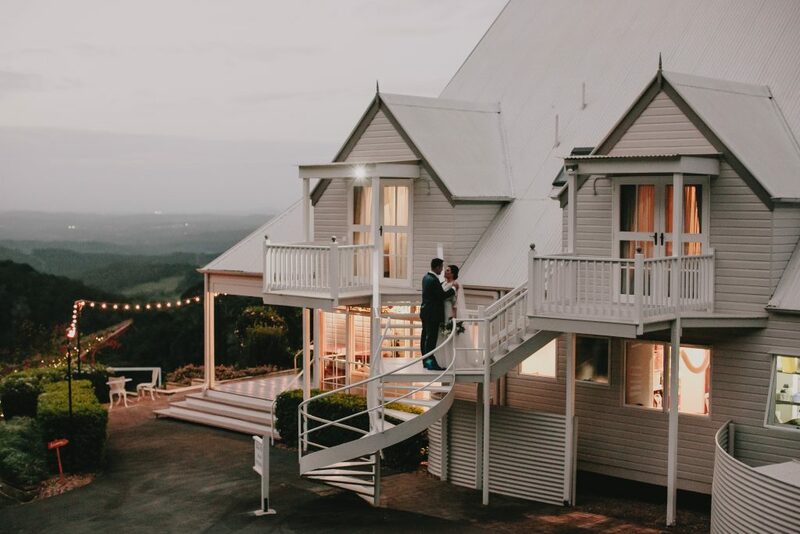 Brooke and Callum chose to host a cocktail reception as they were determined to make full use of the stunning property – I why wouldn’t you! 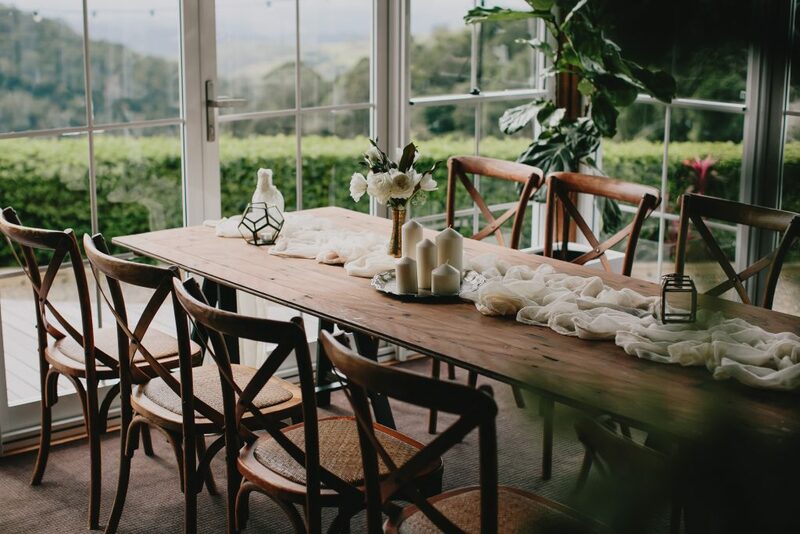 We created whimsical florals in eclectic style antique brass vases, these were scattered around the individual zones and softened the beautiful timber tables. 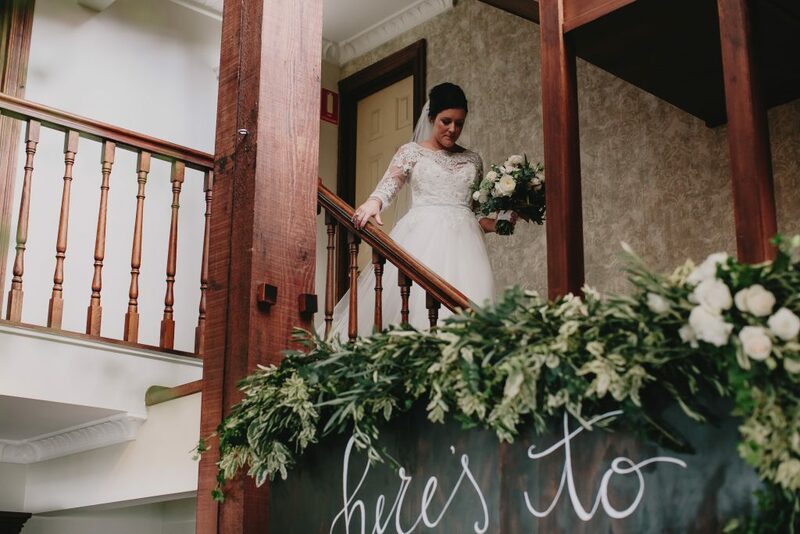 Gorgeous garland features were placed whimsically over hand created signs and greenery pieces were intertwined through lighting features suspended from above. 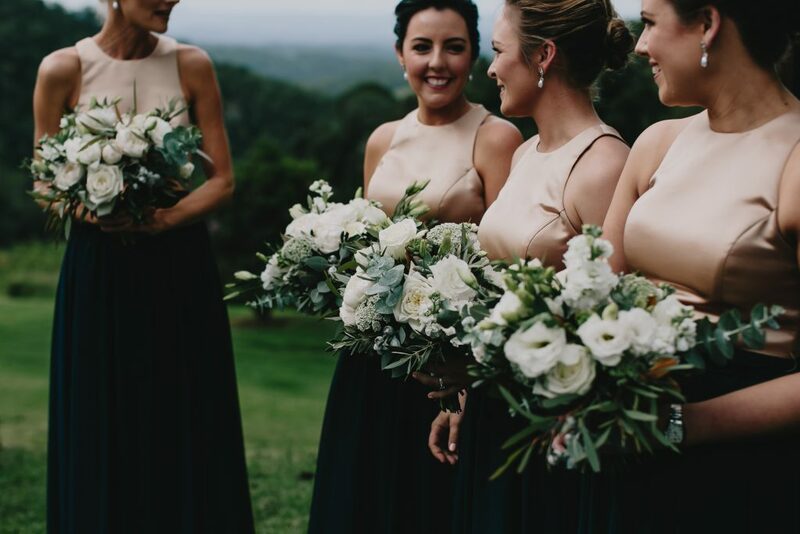 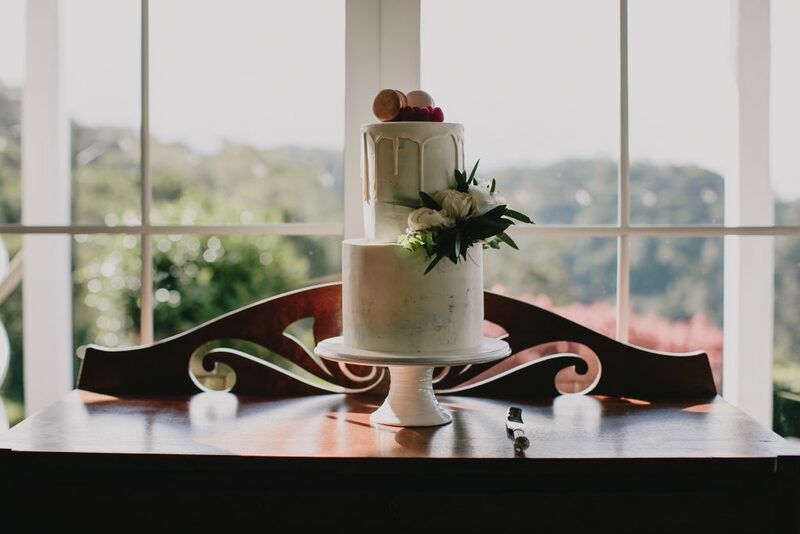 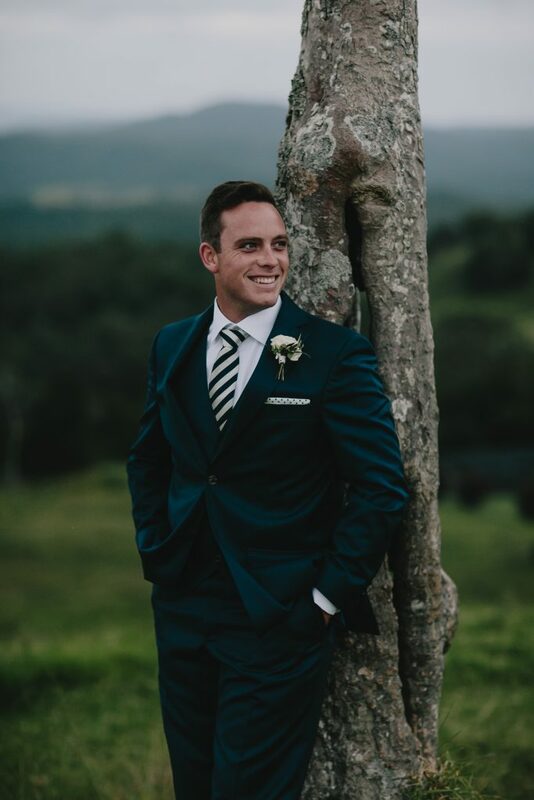 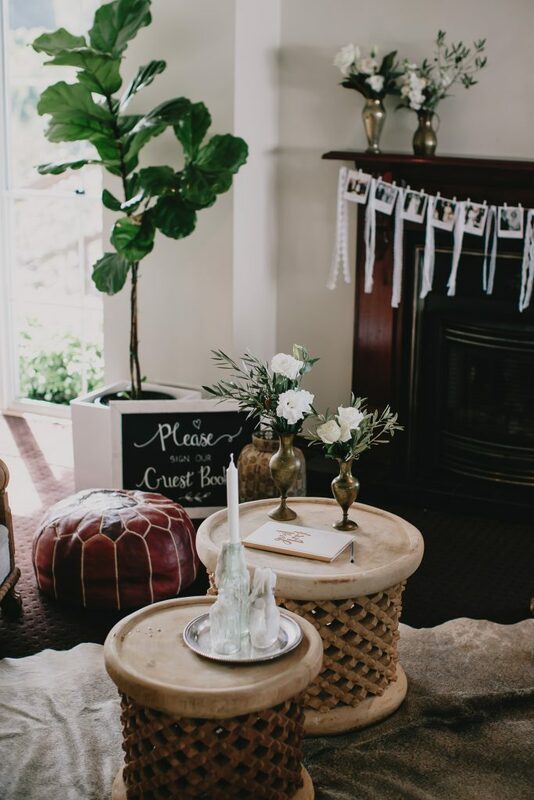 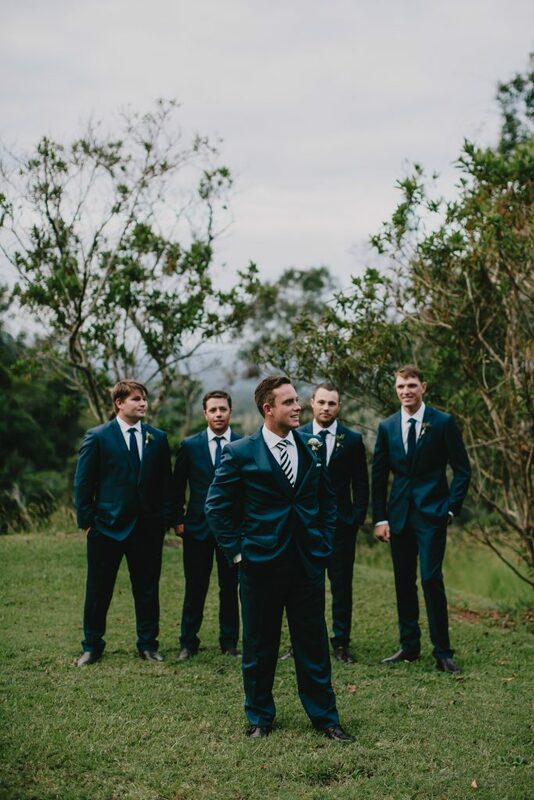 I loved the collection of foliage and greenery we used for this stunning Maleny Manor wedding, the spinning gum, seeded gum and olive leaf foliage added texture and hints of earthy colour to the glamorous yet rustic inspired white floral concept. 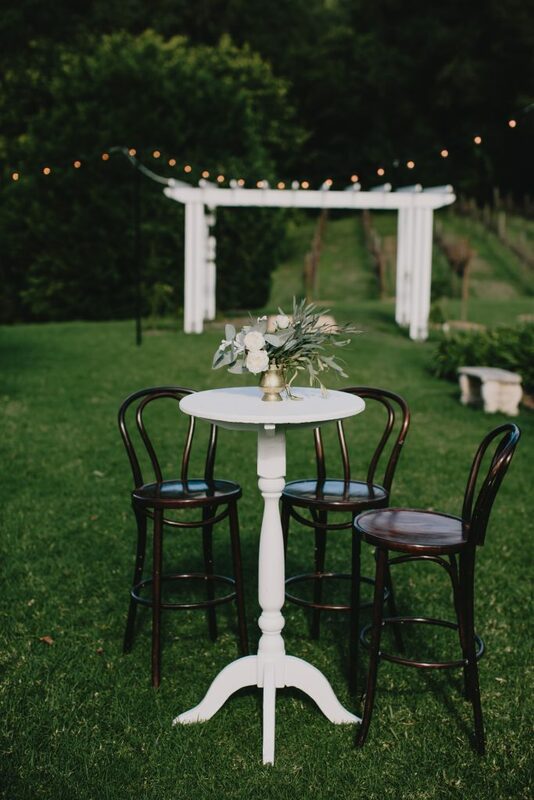 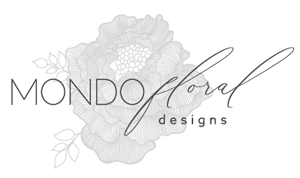 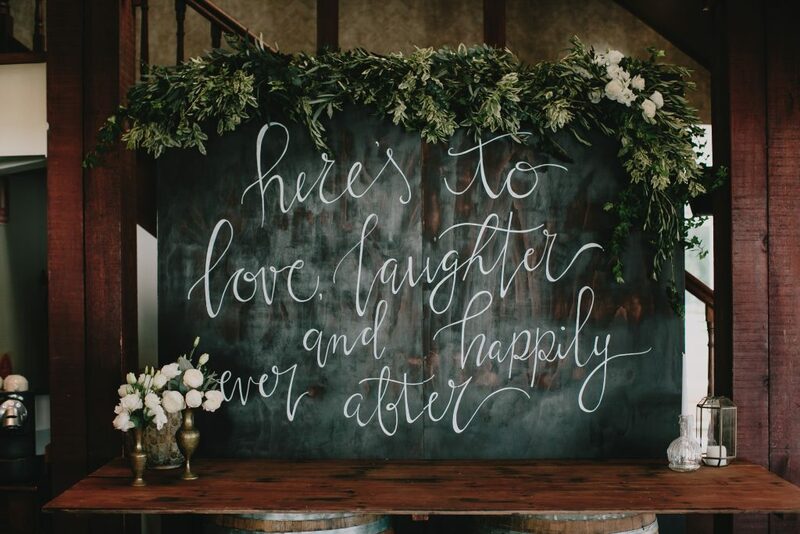 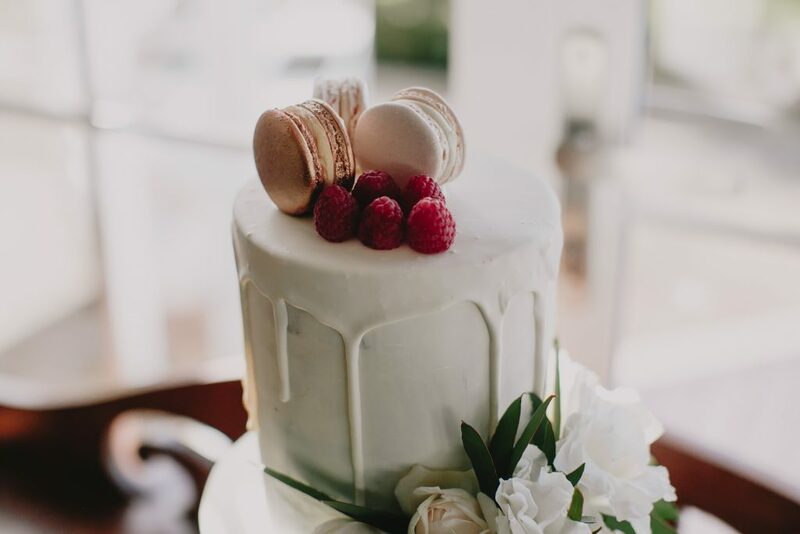 This beautiful venue is certainly a zone for individual style, unique concepts can so easily be created, and personal touches introduced that highlights your vision and allows you to create your own story that suits your specific wedding day style.